MUNICH (Germany) - FIBA Europe announced on Wednesday that the EuroLeague Women Final Four 2019 will be held in Sopron, Hungary, from April 12-14. Following a successful Final Four in 2018, the season-ending tournament will return to the Hungarian city for a second consecutive year, with Sopron Basket playing host to Russian clubs UMMC Ekaterinburg and Dynamo Kursk, as well as ZVVZ USK Praha from Czech Republic. In Friday's Semi-Finals, Sopron Basket will take on defending champions UMMC Ekaterinburg in a rematch of last year’s Final, while Dynamo Kursk will face ZVVZ USK Praha. The season will conclude with the Third-Place Game and Final on Sunday, April 14. The tip-off times as well as information on ticket sales will be announced in due course. "Sopron has proven to be an excellent host, be it for FIBA Women's EuroBasket 2015, various European youth championships or last year’s EuroLeague Women Final Four," commented FIBA Executive Director Europe, Kamil Novak. "We are pleased to return for the 2019 edition of the Final Four, which we expect to be just as well-executed, thanks to the combined efforts from the club and the city, and the support of the Hungarian Government and the Hungarian Basketball Federation. "The fans in Sopron are knowledgeable and passionate, and I am confident they will create a wonderful atmosphere for another celebration of women's basketball." Ferenc Szalay, President of the Hungarian Basketball Federation mirrored the statement of Mr Novak: “The Hungarian Basketball Federation is glad to help with hosting the tournament. Special thanks to the Hungarian Government for standing by our side, and financially supporting the festival of European women's club basketball. "Sport is a strategic field in Hungary, there are more and more sports events organized here, because we are a sports-loving nation with great hospitality. In this line one of Europe's most prestigious basketball events, the EuroLeague Women Final Four is a perfect fit. "I am confident that the participants will have a great time in Sopron again. We, along with Sopron Basket will do everything in our power to host a memorable tournament." 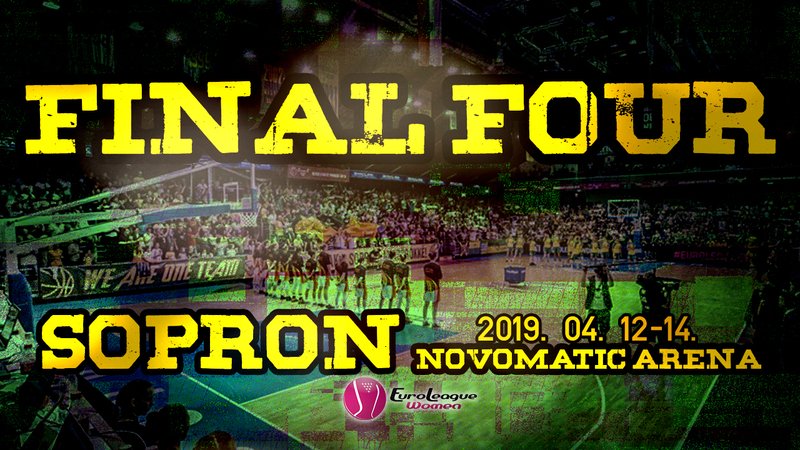 For Sopron Basket it is the third Final Four appearance and Managing Director Zoltan Torok expressed his gratitude for ending a successful season with a Final Four at home. He said: "It is not only Sopron Basket, who have returned to the Final Four, but the Final Four has also returned to Sopron. For me it means that nothing is impossible! Thank you to everyone - especially the Government of Hungary, the City of Sopron and the Hungarian Basketball Federation - who have made it possible for us."